When Deborah Feldman made the remarkable - and scandalous - decision to leave her family and loveless marriage, wholly rejecting her Hasidic roots, she found herself alienated from the only community she had ever known. 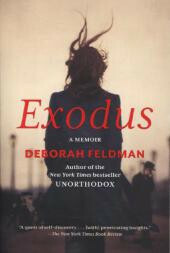 Out of her experience came the incendiary bestselling memoir Unorthodox (Simon & Schuster, 2012), and just a few years later, Feldman has emerged on the cusp of a remarkable journey of self-discovery - a journey in which she begins her life anew, a single mother and a religious refugee, at the age of 26. "One woman's search to understand herself and her Jewish heritage....Rich in details of Jewish life and the lives of her grandparents in the World War II era, [Feldman] sensitively portrays the inner struggles of accepting the pervasive feeling of survivor guilt and her own desires to understand the woman she was becoming. Feldman juxtaposes painfully emotional moments in concentration camps and in European towns where evidence of Jewish settlers was practically erased with humorous, almost macabre playacting scenarios with a German lover, scenarios that only added to Feldman's confusion over her own identity.